The Nerf Modulus ECS-10 is definitely one of Nerf’s more well-known blasters with each of its customizable sections and add-ons. The question is, however, how does it compare to some of the other blasters on the market and is it worth purchasing? If you’ve been looking into this blaster but you want to know more about it before making your move, here is our Nerf Modulus ECS-10 Review. What Is the Nerf Modulus ECS-10? 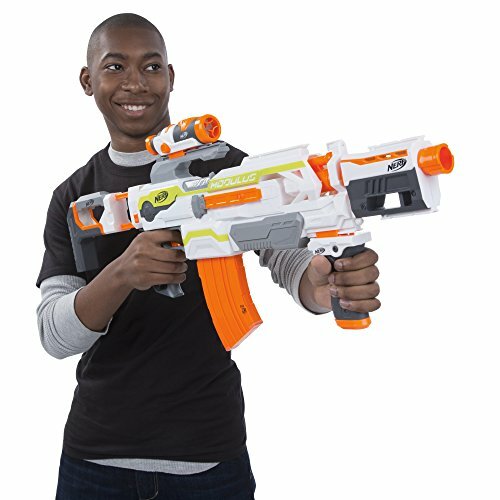 The Nerf Modulus ECS-10 is a highly customizable, fully motorized blaster from Nerf’s N-Strike Modulus series that offers over 30 different blaster combinations with its basic kit. In addition to these 30 blaster customization options, Nerf offers another four expansion packs to this blaster, which increases the possibilities of 30 blaster combinations to around 1,000 different blaster combinations. The blaster itself is quite simple and comes with some of the customizable options. The rest of the pieces are sold separately. You can see more about the blaster and what it looks like here. The Nerf Modulus ECS-10 is definitely one of the more aesthetically pleasing options that Nerf has put on the market to date. 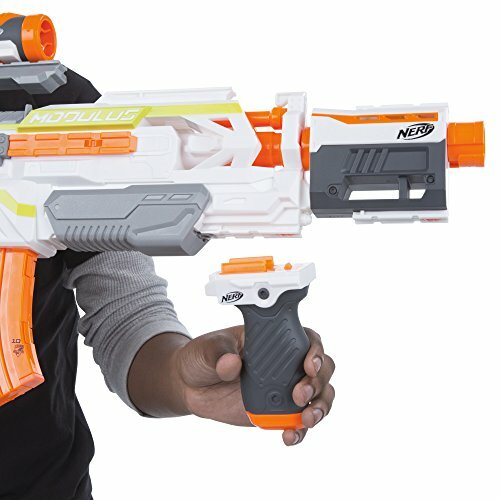 Without the additional pieces placed on, the Nerf Modulus ECS-10 looks similar to the Nerf N-Strike Elite Disruptor in build, without the rotating drum in the front since the Nerf Modulus ECS-10 utilizes a clip system rather than the traditional drum. In lieu of the traditional blue and orange coloring that we see in the Nerf N-Strike series, the Nerf Modulus ECS-10 has a mostly white casing with lines of green or orange placed throughout the casing to produce a sleek and mechanical feel. As far as the body of the blaster goes, the gun is very well-built and has to take severe amount of damage before it starts to malfunction or break. The only difference between this blaster and traditional models is the way in which you load and shoot your bullets. At the bottom of the gun is a rectangular hole designed to fit a banana clip that can hold up to 10 darts, which comes with the blaster when you first purchase it. This clip amount can obviously be modified if you choose to purchase larger clips that work with this blaster. To prime the blaster to shoot, all you have to do is press the orange button located underneath the first trigger. This button will activate the motor within the casing. Once you’re ready to spit out your foam darts, all you have to do is press down on the top trigger. Past these basic design aspects and functions, the Nerf Modulus ECS-10 has plenty of tactical rails and attachment points that give you a ton of customization options. Overall, the Nerf Modulus ECS-10 is a very well-built blaster that is also great to look at. Now that we’ve covered the body and design of this blaster, let’s take a look at some of its features. What Does the Nerf Modulus ECS-10 Have to Offer? Nerf boasts a 90-foot firing range on this blaster and states that accuracy is maintained even at this distance. The Nerf Modulus ECS-10 has over 30 customizations that are quite easy to make even during a Nerf battle, making it desirable for those who need to quickly make changes during wars. Uses a clip system rather than front-end loading and rotating drums like other Nerf blasters. This blaster comes with its own attachable and pre-installed scope, which helps you make more accurate shots. The barrel of the Nerf Modulus ECS-10 has tactical rails on both the top and the bottom, giving you the ability to add all kinds of parts to your gun. This blaster is fully motorized and semi-automatic, which means all you have to do is pull the trigger to spit the bullets out of your clip. Made out of high-quality plastic, the Nerf Modulus ECS-10 is made to withstand falls and all kinds of accidents. Has a comfortable grip that helps with holding the gun and making accurate shots. In addition to some of these features, the Nerf Modulus ECS-10 is also a desirable choice for most Nerf enthusiasts because of its ability to be altered using other gun parts in the Nerf Modulus series. Therefore, if you own the Nerf Modulus ECS-10 as well as the majority of the other blasters in the Modulus line, you will have no limit to what you can do with your blaster. The options are endless in the Modulus line! There is a lot to love about this blaster but let’s cover a few of the major things that most Nerf users like about this blaster. The first and the most major aspect that people like about the Nerf Modulus ECS-10 is the fact that it can be so heavily customized. The Modulus series was meant to give Nerf users more freedom and the fact that this blaster can handle over 30 combinations on its own and approximately 1,000 within the series is more than impressive. The next thing that Nerf users love about this blaster is its power. 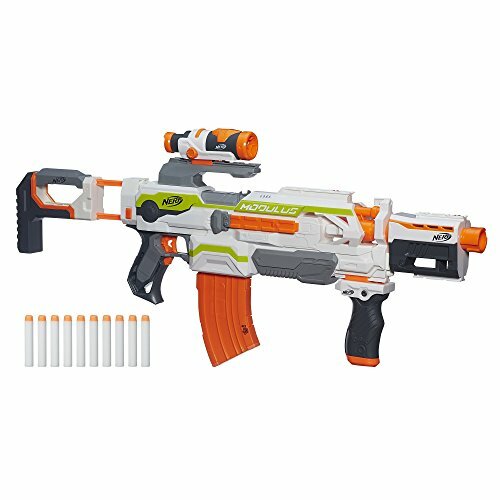 Because the Nerf Modulus ECS-10 is battery-powered and designed to be accurate, it packs quite the punch and is great for almost any type of Nerf battle. 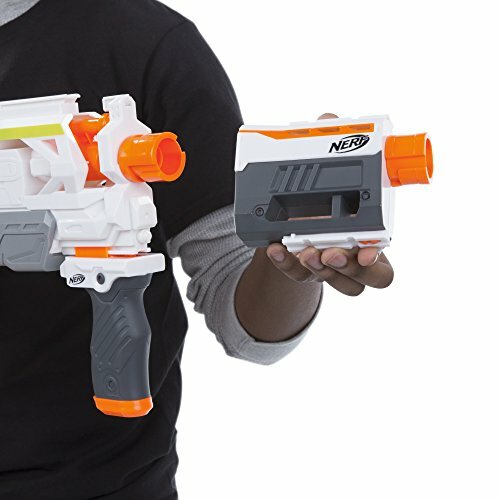 Along with the fact that this blaster is powered by batteries and designed to hit its target, the Nerf Modulus ECS-10 also has a much larger range than most of the other blasters created by Nerf and is capable of reaching up to 90 feet. What Are Some of the Disadvantages to the Nerf Modulus ECS-10? There are generally only three complaints that Nerf enthusiasts have about this blaster. 1. The first complaint is that this blaster requires 4 AA batteries. While this is definitely an improvement compared to some other Nerf blasters that require big batteries or larger quantities of smaller batteries, there is still the issue with the fact that blasters require a lot of power, which means more batteries that have to be purchased. 2. The second complaint is that, while the blaster is customizable, you can’t add too many features to it. If the blaster is overloaded with additional parts, it adds stress to the barrel and makes it harder to shoot out bullets and maintain its accuracy. Also, because the gun uses batteries to operate, it is known to jam and to be hard to fire on occasion. However, this can be said for almost all Nerf guns and shouldn’t deter you from looking into the Nerf Modulus ECS-10 as a possible purchase. The biggest question for most Nerf users is, is the Nerf Modulus ECS-10 worth the price? Although this is a little on the expensive end for most Nerf users, what you get and what you are able to do with it makes it more valuable than some of the other blasters available on the market at the same price. 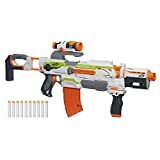 With over 30 combinations in the original set and more than 1,000 combinations possible across the entire series, buying the Nerf Modulus ECS-10 for only $50 is a great choice. Since the upgrade kits are often additional pieces and not blasters themselves, you won’t have to spend much more money to buy the pieces that you can place on the tactical rails such as scopes and grips. These pieces will usually only cost you around $5, which is very cheap when it comes to Nerf add-ons. 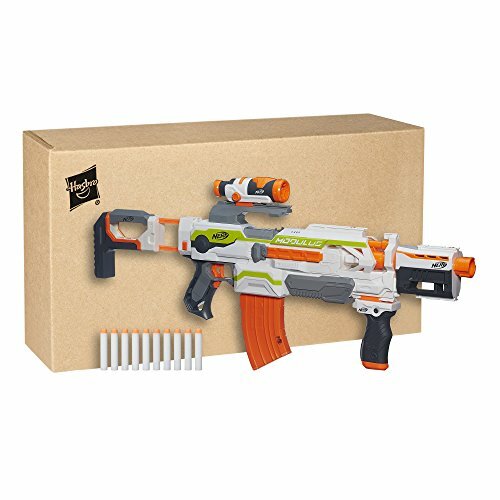 So, is the price of the Nerf Modulus ECS-10 worth it? Considering what you get when you purchase this blaster and how little you will have to spend in order to upgrade it in the future, this is a great buy. Keep in mind, however, that in order to get the most out of the Modulus series and to make all 1,000 possible combinations, you will have to buy more of the Nerf Modulus series blasters in the future, which will cost you more money down the road. The Nerf Modulus ECS-10 is a great blaster for anyone who loves modifications and accuracy. Although there are some drawbacks, such as the fact that it requires batteries to fire and that it can’t hold too many modifications at once, its ability to change into any blaster you need during combat makes it a highly valuable gun to have on hand during any kind of Nerf battle. Need more information on the Nerf Modulus ECS-10 and its accessories? Here is a great ECS-10 review that will help you learn more about the blaster and come to your own conclusion!